Full disclosure: Midwood Smokehouse is my favorite restaurant (my dad & his service dog, Caine, are well known at multiple locations). They have delicious food and an awesome staff. BBQ is serious business in the South. Depending on where you go in North Carolina (and where you were raised), one can find one of three bases: tomato (the only acceptable BBQ for my body), vinegar (pass), and mustard (gross). With four locations in North Carolina and one in South Carolina, their scrumptious food is spreading throughout the Carolinas. 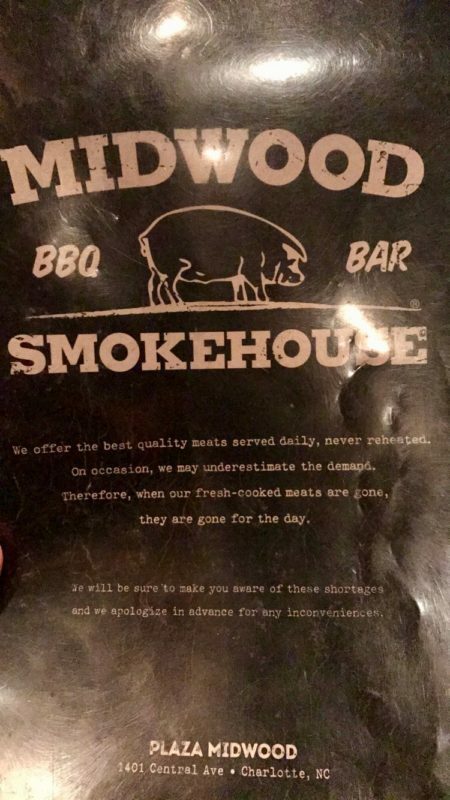 Midwood Smokehouse has 4 locations in Charlotte & surrounding areas and Columbia, SC. All BBQ sauces are gluten-free. Midwood Smokehouse also offers custom salads. Check out their menu for more. Note: Soybean oil is used in the fryer and for the ribs. Nikki ordered the Carolina Pork with a plain salad with cucumbers. Unfortunately, we either didn’t take a picture of her food or it was put on Snapchat and not saved. The pork caused Nikki some slight stomach discomfort. To make up for it, here is a picture of the burnt ends that Nikki is thinking of ordering on our next visit. Just pretend the hushpuppies and mac and cheese aren’t there. It’s okay to drool on your screen. I won’t judge. My dad has been to several locations and has tried everything on the menu (he lives just minutes from the Plaza-Midwood location). I know you’ve been waiting on some #foodporn and I got you covered. I usually get the Carolina Pork as well, but on this occasion, I decided to change it up. I ordered their Cuban sandwich, along with hushpuppies (Caine’s favorite) and mac & cheese. I am hungry just looking at this picture. 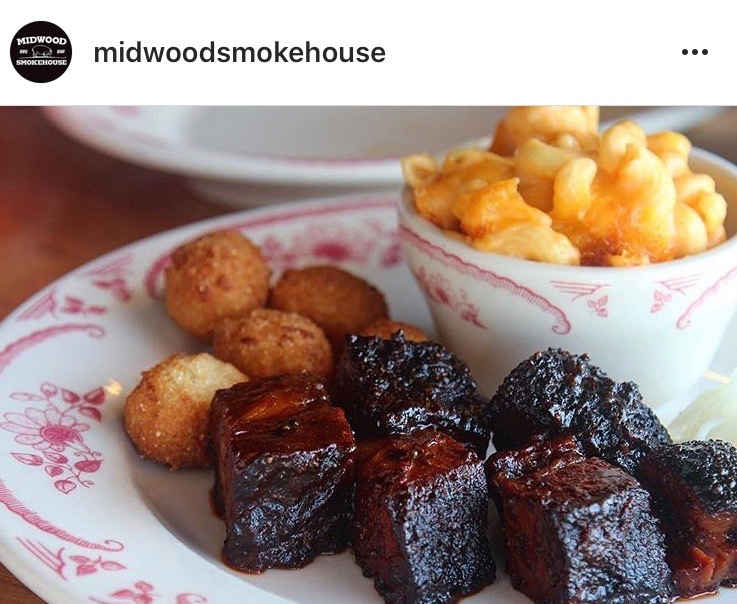 Even though the pork caused Nikki some discomfort, we want to go back to see if she can eat the Burnt Ends and go back to eating at Midwood Smokehouse more often. We highly recommend them! If you liked this, you might also like some other local restaurants: Kickstand (which is down the street from Midwood Smokehouse), Bad Daddy’s Burger Bar, The Burger Company, and Showmars. As always, sharing is caring. Don’t forget to follow GFS on social media using the handy dandy buttons below. Oh my yumminess, those burnt ends look so delicious Sam and the Cuban sandwich too. One of those would go down a treat right now. I just have to ask, did you save of your hushpuppies for Caine or does he get his own when you guys go to Midwood? My dad & I both shared them with Caine. However, he does get his own hushpuppies at some places. At another restaurant, the waitress tore them into pieces since they were hot and she didn’t want him to burn his mouth. LOL He’s so spoiled! Wow I am absolutely starving now!!!! This food looks absolutely delicious and I’d totally love to try this place!!! I think I might have to go there this weekend! Looks like they have a great menu. 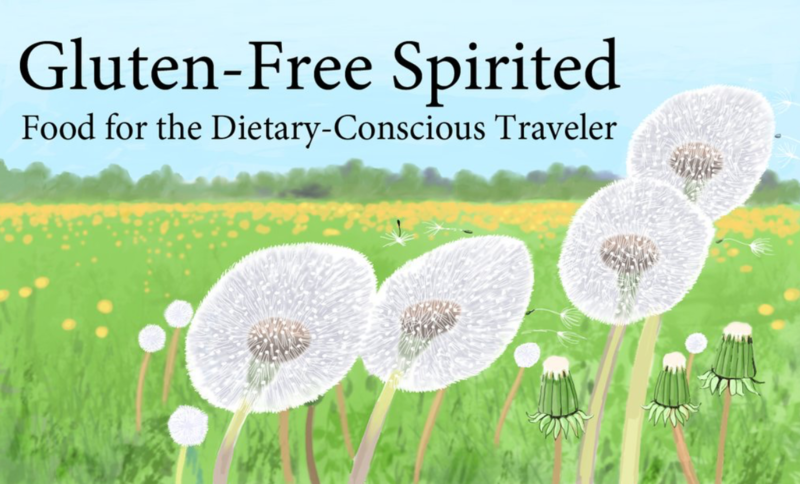 I am going to North Carolina this summer and I will check this out! 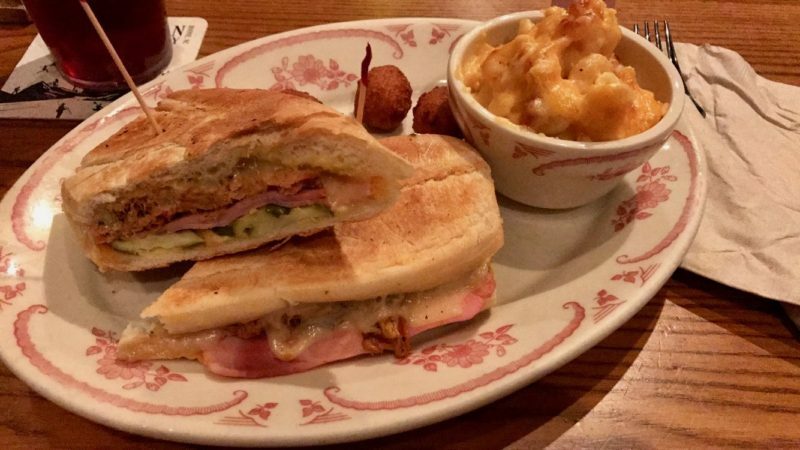 That cuban sandwich, OH YUM! All the yums in one single picture! I would love to eat there, I like the sound of the smoked veggies too! The Cuban is SO good and I love BBQ. It’s hard to choose between the two! I’m from KC, so I’m familiar with BBQ! However, as a vegan I don’t go to many BBQ restaurants anymore. It is nice that they offer smoked veggies!! You definitely know about BBQ! 🙂 It’s nice that try and have options for various diets. That all looks incredible. I know it’s hard with restrictions – my FIL has a few. We’ve noticed that when we go somewhere new that if we ask most places are very generous about helping out. Especially the little mom & pop shops. We’ve noticed that as well. Most places try to be accommodating, which is nice. Oh, I’m sorry that nikki got stomach discomfort with what she ordered! wha is it soybean oil so popular in the US restaurants? I’m not familiar with this here. Thanks, Nati. I really don’t know why it’s so common here. There’s also been reports recently that it isn’t good for your health & can cause cardiovascular problems. Looks like you guys enjoyed the food. I can see why it is your favorite restaurant. I’m definitely ready to go back ASAP! This sounds like a great place to eat. It really looks like you enjoyed it. It’s nice to hear you would go back even though the pork did cause some discomfort. We did! Hopefully, she’ll have better luck on the next visit. I was drooling editing the pictures and writing about them. lol It’s an easy recipe and so yummy!